Planting the seeds, shaking the bushes. When we bought Bright Water 14 months ago, there were no Cal 2-46’s for sale in the United States, and only three for sale worldwide. We contacted every owner we could find to see if they wanted to sell their boat. Apparently we started something. Right now on Yachtworld, there are eleven Cal 46’s for sale on Yachtworld (www.yachtworld.com/core/listing/cache/searchResults.jsp?cit=true&slim=quick&ybw=&sm=3&searchtype=homepage&Ntk=boatsEN&Ntt=&is=&man=cal&hmid=0&ftid=101&enid=0&fromLength=45&toLength=47&luom=126&fromYear=&toYear=&fromPrice=0&toPrice=&currencyid=100&city=&pbsint=&boatsAddedSelected=-1) plus at least one more in Seattle listed only on Craigslist. So, if you like what you’ve seen on our blog, today would be a good day to start your own adventure. Some of these boats may not need tanks and motors and shafts and props and refrigeration and electronics and electrical upgrades and sails and rigging. Actually, they’ll probably all need some or most of these things. Start anyway. You know you wanna. One man’s treasure…and a newt. 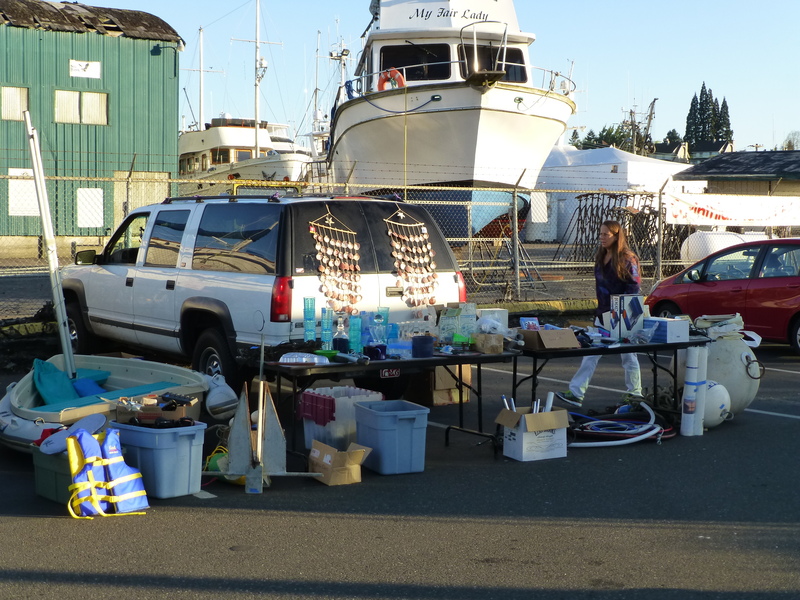 When people here in Washington State collect too much boat stuff, they haul it somewhere and sell it to other people in the boat stuff bidness. This year we’ve managed (so far) to end up with less stuff than we started with. 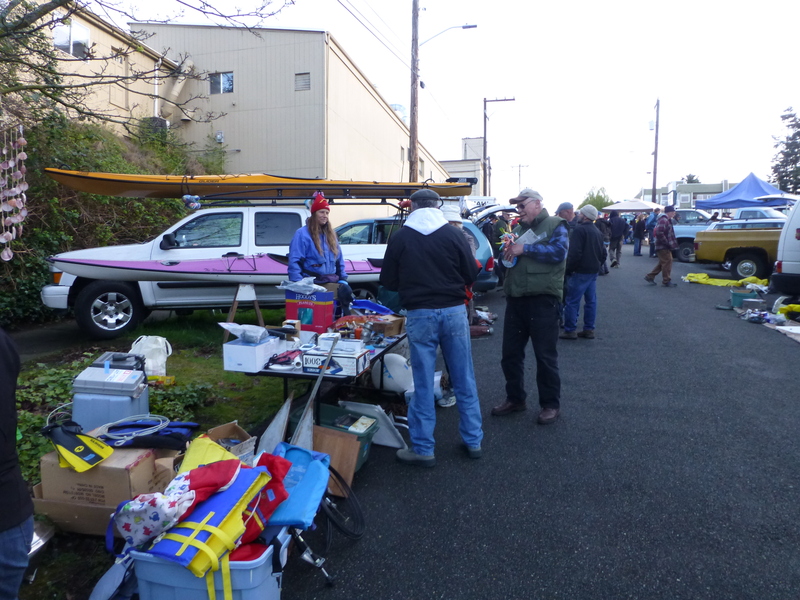 The Seattle boat stuff exchange was on a cold, rainy morning (Duh). Usually this yearly event is all over by about 7am. The setting-up and the shopping starts at about 5am and the biggest deals are done by flashlight. We showed up about 6am and could hardly find a spot. But we found a place and set up two tables and sold stuff until about 9am when the dark clouds scared us back to the truck. We didn’t want to get our valuable stuff wet. 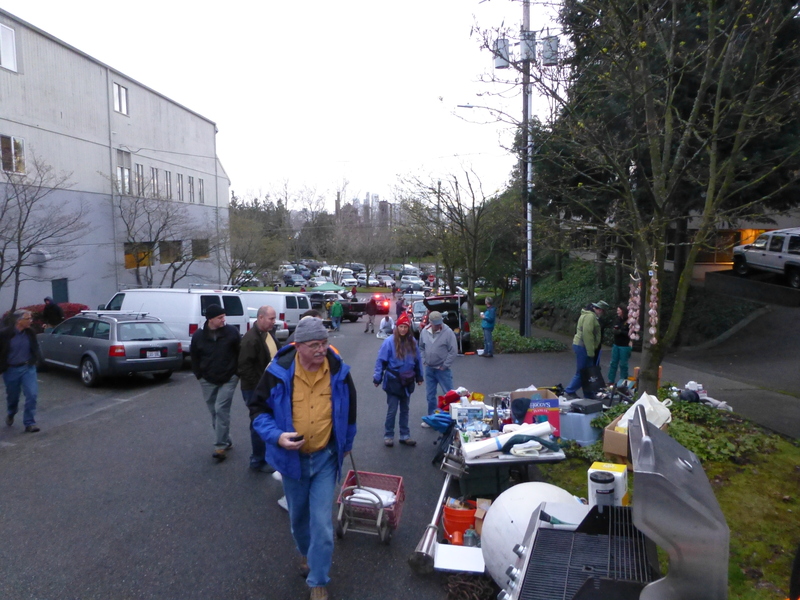 The Bellingham stuff sale was yesterday on a beautiful Saturday morning. 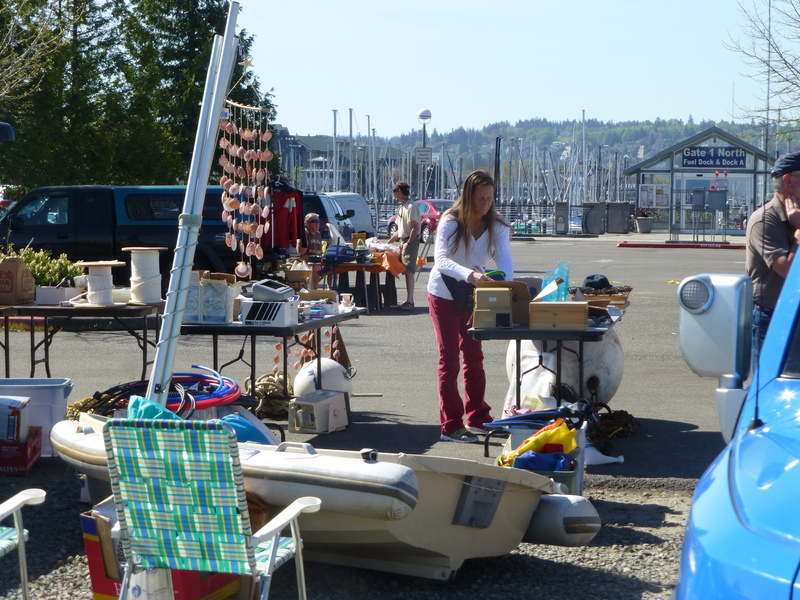 It was so beautiful that all the potential stuff buyers decided to go boating and nobody showed up to buy stuff. We sold a little and bought a little. It was a beautiful day, none-the-less. 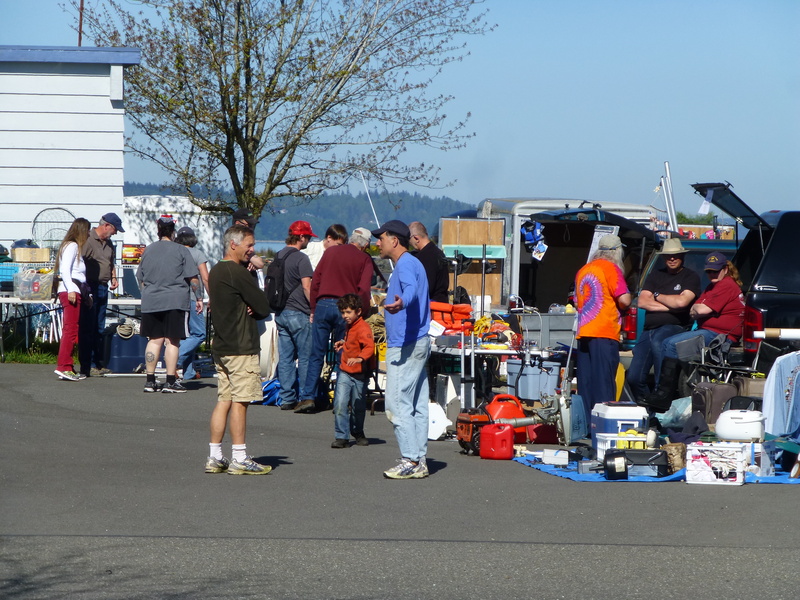 This morning (Sunday) was also stunningly beautiful and, again, very few buyers showed up at the Boat Stuff Sale in Everett. 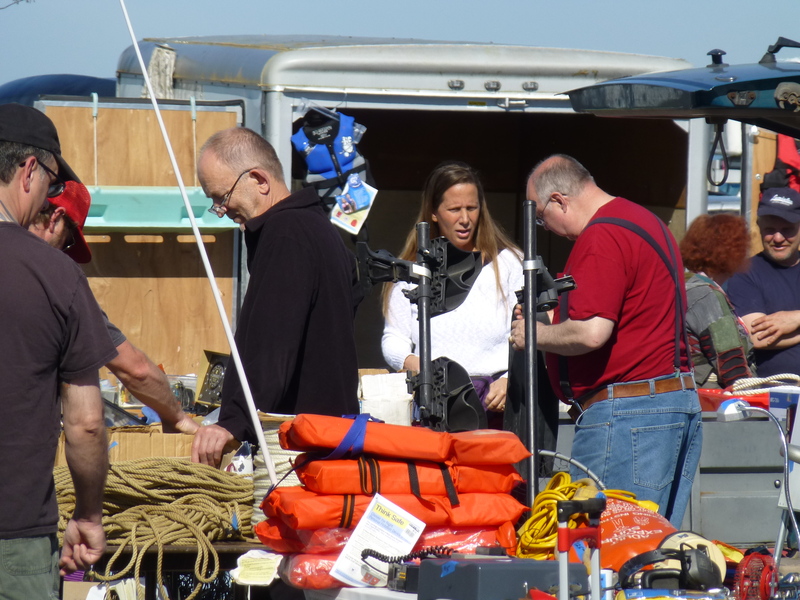 We had a very nice morning getting a little sun and talking to the boat stuff sellers around us, though. Nancy is especially good at the talking to people part and pretty good at the getting them to buy stuff part. I unpack the stuff, walk around and try to not buy new stuff, and pack the stuff. This year I did pretty good at the not-buying-new-stuff part. So we’ve got a little bit of stuff left to sell. Back to craigslist. 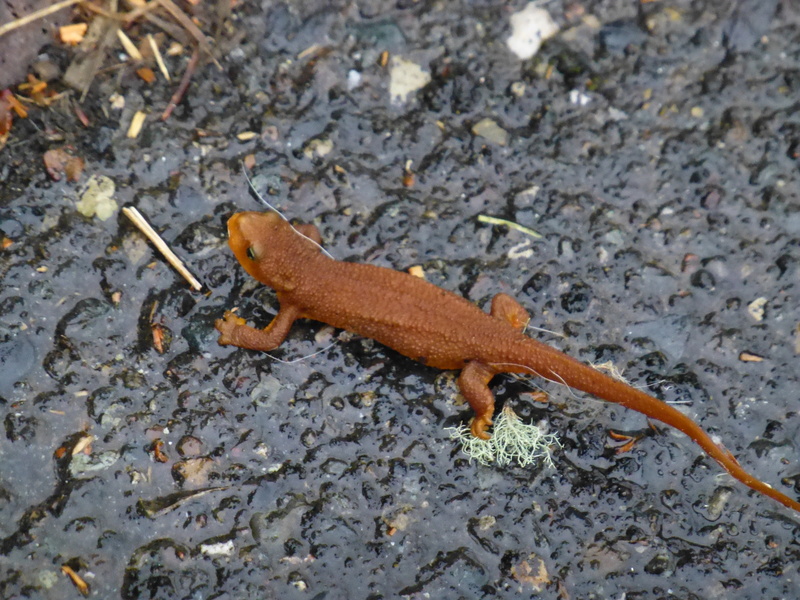 This is a newt. A giant Pacific newt. It’s fun to say newt.